Let’s talk television, taking a commonplace rant observation about cable companies and thinking about what it means for the future of content creators. Before I rant – er, observe – let’s set the framework for why this stuff matters. We spend plenty of time talking about the great opportunities for creatives in The Jetsons Future. If you’re a content creator, you can send your brilliant creative work all over the world through multiple channels at once, using both smaller (such as your personal Facebook page) and mass (e.g. YouTube) digital distribution channels. What about the content giants, the major studios? While most are making smart use of the YouTubes and Vimeos of the world, they’re all but required – surprise! – to rely on traditional big distribution, meaning broadcast, cable and satellite. We already live in a world that is transitioning from delivery of content via broadcast to broadband, so let’s dispense with the topic of broadcast today and move on to the latter two. Major content producers could distribute their content through their own branded delivery channels (not just websites and apps, but their own SVOD or AVOD systems), bypassing the rest of the industry completely. New content aggregators/distributors will arrive on the scene. 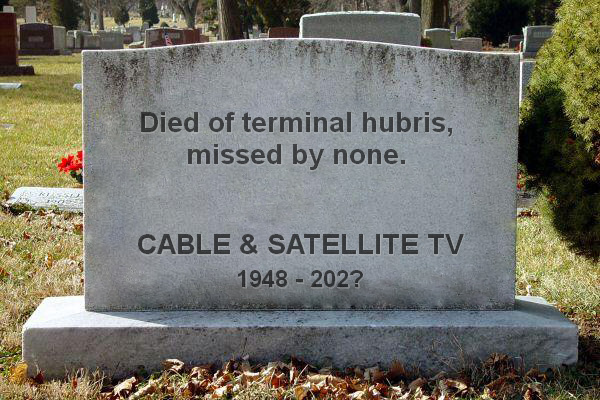 We’re talking about a digital equivalent to what cable and satellite are currently doing, but with a handle on the media business as it is currently developing..
That second option – the existing cable and satellite operators? You can pretty much scratch their model. They won’t be transitioning to the digital future. It takes a lot to blow the inherent advantage that having a huge pre-existing customer base provides. You almost have to willingly choose to be self-destructive. Okay, rant time. If I thought for a minute that mine was a unique experience, I wouldn’t bother telling you about it. I know better. Frankly, it was just a couple years ago that, as a broadcaster, I sat in a meeting with senior marketing executives from a major cable provider. They wanted my thoughts on improving the public perception of their company’s customer relations, which they admitted was particularly dim. That company is the same one that leads off this brief tale. His inadvertent punchline: “As a loyal customer of our company, we’re pleased to offer you continued service at [the exact new price I was refusing to pay].” The poor guy had to listen to me hyperventilate with laughter for about three minutes before I could collect myself enough to continue the conversation. When I regained the ability to speak complete sentences, I asked him to cancel my service, noting that if my “loyalty” was to be rewarded in that fashion, I was withdrawing it. The additional charge was immediately removed from my bill. In the words of infomercials everywhere: but wait, there’s more. Some Quality Time With An Unnamed Satellite Television Provider. What else would a negotiator do, but find a second offeror to negotiate with in search of a better deal? Enter our unnamed satellite television provider. Like any prepared negotiator, I already knew what option I wanted to price; I simply needed to know how much the “free” extras on the package were going to cost me in the second year of my putative two-year commitment. I asked their “customer service” rep. to skip the script her company expected her to read and provide me with the pricing information I wanted. Instead, the woman on the phone told me all the wonderful reasons their service was so much better than my existing service. When I again asked her to drop the script and simply provide me with pricing information, she continued to ignore me and asked for my e-mail address, telling me I’d “receive better offers directly from [provider] than what I’m telling you about today.” Translation: we do not respect your time; we have a script we’re going to read you, and by God, you will hear every second of it, whether you want to or not. You may safely assume the call ended within seconds. The two people I spoke with on the phone are blameless. They were very pleasant, and no doubt, they were conducting themselves as they’d been trained. Hence the problem. And yes, customer service everywhere is horrid. In the words of a very wise friend, “This could have been a customer service call with any company but Zappos.” Just one problem: not every business is currently experiencing an existential moment. 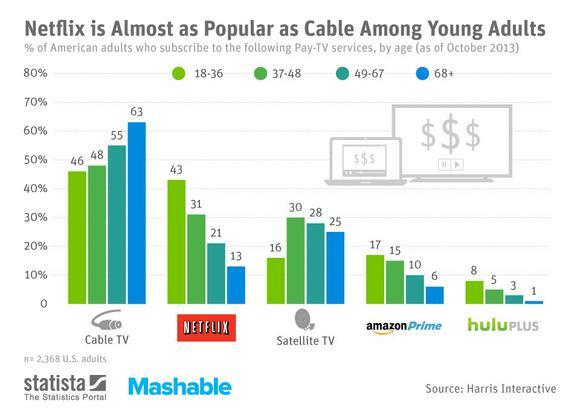 Television distribution, on the other hand, is. Money – a lot of it – is at stake right now! If you’re the CEO of a cable or satellite company, if you’re sitting in the meetings where your company’s business development strategy is being contemplated, if you’re on the board of such a company, what the h-e-double-hockey-sticks are you thinking? Do you consider hidden charges, hard sells, and an absurd overfixation on building your customer database a plan for revenue growth? Have you missed out on the fact that today’s consumer sees through the smoke and mirrors of upcharges? Have you missed cord cutting? Do you not understand why it is happening? Are you really, genuinely surprised that it is happening? Are you self-destructive? The future is already trending away from you. Wake up! Of course, if you’re the person or company making content, you need to wake up too. Keep your eyes and ears open for the latest developments with content distribution, and remember that, in a world where everything is changing and re-changing at lightning speed, what’s best for your content today might not be best next week. Replace the printer with a cable box, and you have a good idea about cable’s customer satisfaction.